Students Denis Seletskiy and Seth Melgaard in the lab. The pair, along with Professor Mansoo Sheik-Bahae and other researchers made a promising breakthrough in optical refrigeration with a novel alternative to bulky mechanical cryo-coolers. 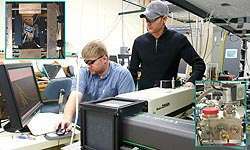 (PhysOrg.com) -- Researchers at the University of New Mexico have established a new low in temperature cooling through laser cooling of solids to cryogenic temperatures. Under an AFOSR, MURI grant, a team led by UNM Professor, Mansoor Sheik-Bahae, created the first-ever all-solid-state cryocooler (temperatures that can only be obtained by liquefying gases and mechanical refrigerators) that can be used for a variety of applications ranging from cooling infrared sensors to superconducting electronics. This work was just published in the January (online) issue of Nature Photonics. To view the paper visit: Laser cooling of solids to cryogenic temperatures. Graduate students Denis Seletskiy and Seth Melgaard designed and performed the experiments at UNM's Department of Physics and Astronomy in collaboration with researchers from Los Alamos National Lab and the University of Pisa, Italy. The consortium research project grew out of a collaboration with Los Alamos National Labs more than seven years ago. Laser cooling of solids, also known as "optical refrigeration", is the process of lowering the temperature of a solid by shining laser light on it. The heat is carried away from the material via fluorescence that follows the laser absorption. Early experiments at Los Alamos back in 1995 led to a cooling of about 1 degree cooling. Subsequent improvements led to an absolute temperature of 208 Kelvin (K) or -65 degrees Celsius starting from room temperature. Further improvements, including extremely high-purity materials, together with gaining better insight into the physics of luminescent crystals have enabled the researchers at UNM to reach a new milestone by cooling to temperatures below what is achievable by standard thermoelectric (also known as Peltier) coolers. To achieve their results, the scientists enhanced cooling efficiency by exploiting resonances in the absorption spectrum, growing pure crystals, delicate thermal load management and by trapping laser light in an optical cavity. “We tune high power lasers to excite sharp resonances of Ytterbium ions sitting in a fluoride crystalline host,” explained Seletskiy. “We trap laser light by careful alignment of the optical cavity mirrors inside of a high vacuum chamber. A specially designed and coated sample chamber allows us to minimize parasitic heat load from the environment. Further advances in this technology may lead to applications in cooling superconducting electronics, infrared and gamma-ray sensors. Many other novel applications where miniaturized cryocoolers are needed will also benefit from this technology. Previously, solid-state coolers, based on standard thermoelectric (Peltier) devices, have only been able to reach temperatures as low as 170K, however with minimal efficiency. Sheik-Bahae and his team will continue collaborations with Professor Mauro Tonelli and his researchers at the University of Pisa in Italy as well as with Richard Epstein and Markus Hehlen of the Los Alamos National Lab, and Prof. Kevin Malloy from UNM to further this research towards achieving lower temperatures and developing the technology for practical, compact and efficient cryocoolers. Has anyone looked at the applications of these techniques to improve basic refrigerators or heat pumps for homes or businesses? That is, might these techniques be more efficient and/or less expensive at cooling (or possibly heating) than current methods? Or might this be as inefficient as, say, opening your hot oven to heat your home? dk2009: "Or might this be as inefficient as, say, opening your hot oven to heat your home?" That's a bad example. The heating efficiency of an electric or gas range is about the same as an electric or gas heater. There are *many* other safety reasons not to do this though. I think the analogy you're going for is that cooling your house by opening your fridge would be pointless, as the net heat would increase. Great tech, useful in cooling the walls of thermonuclear fusion reactors, i also envision on the flipside; the potential of laser field interferrometry to catalyze quantum atomic fission for fusion reactor processes. A device like a microwave oven in reverse that quickly chills any hot objects placed in it would be very welcome in the kitchen. Could laser cooling achieve this?